Did You Miss Me? : A Brief Summary of My Trip – my books. my life. 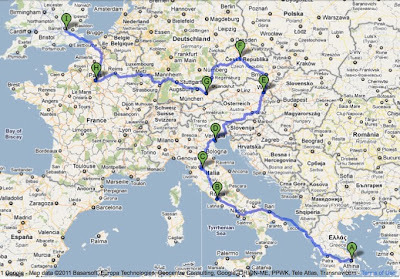 When I went on a three week road-trip in 2008, I shared my trip with you in numbers. Since there is no way I can adequately wrap-up this trip either, I thought I would do the same. High:I’m going to cheat here because I loved Paris the most. Musée de l’Orangerie, the Eiffel Tower, the dinner cruise on the Seine were three of my favorite things. Low: It was HOT (like over 100 degrees) and Paris does not have AC. Low: I was exhausted by this point and kind of done sight-seeing. The entire trip was amazing. Sure, there were times I was exhausted and three-and-a-half nonstop weeks is a long time to spend with one person (even if that person is your husband), but I am so thankful I had the opportunity to take this trip. I know that I am very lucky. I will miss Ben while he is off being super-smart and studying at Oxford, but I do enjoy the time on my own (maybe I’ll actually do some actual reading this year). I know that I updated you all with photos on twitter and tumblr as I went, so I’m not sure if I should post any here. Would you like to see a few of my favorites? Or would you like links to some pictures for each city? Finally, I am happy to be home. I am glad to sleep in my own bed, use my own shower, and wear different clothes. I am also happy to get back to blogging and catching up with everyone. I did miss you, even though you popped up on Twitter! So glad you posted this – reminded me of my own travels around Europe. Welcome home! Wecome back! You really did it all! Wow. I can relate with the 24/7 for three weeks thing. Not so much issue with my husband but sometimes the kids. We had planned to see Prague, but family issues got in the way. Boo. We did see Krakow instead, but it isn’t quite the same. Now, aren’t you glad to be home where there are big showers? It does sound like you had an amazing trip, and I am very envious of all the stops you made! Three weeks is a long time to be away, but I can imagine that you were having such a wonderful time that the days just flew by. Glad to have you back, though! That’s so awesome! What a great trip! Sounds like you made some great memories. Glad you made it back safely. I feel like you were gone for months and months! Looks like such a fantastic trip (despite the lows). It’s amazing to be able to experience these once in a lifetime trips. So glad you enjoyed it all! Yea! Everything sounds fantastic. Love the wrap-up, and I’d also love to see more pics. Glad you’re home safe and sound. Enjoy your shower/bed/etc. So excited that I came in over Wicked. It was great meeting you! I love the break down into numbers, looks like it was an incredible adventure. I would love to see more pictures! This looks like it was an amazing trip! I loved your twitter updates while you were away, but it would be cool to see some of your favourite pics here. Sounds like a fantastic trip. I’ve been to all of those cities except for Athens, but hopefully that one will be added to the list soon!